The following concerts are in conjunction with a benefit Larry Keel and Natural Bridge is hosting for an entire weekend for our good friend Billy Constable. Billy has been diagnosed with a brain tumor and has just had brain surgery and does not have insurance. LKNB will be accepting donations on his behalf, donating their merchandise sales and hosting a 50/50 raffle to raise money for Billy to offset his medical expenses. Visit www.billyconstable.com for more info. Billy has been diagnosed with a lump on the lower portion of his brain which has been causing increasingly frequent seizures. He is currently seeing medical specialists and gathering evaluations. The expense is certain to be high, and Billy is without medical insurance. We are coming together, as friends and fellow musicians, to help offset those costs. Billy Constable grew up in a very musical family in Avery County, and he has been playing music for most of his life. Billy is part of Avery County’s Wiseman family, which includes a number of professional musicians including Scotty Wiseman, Lawrence Wiseman, David Wiseman, Fiddling Jimmy Wiseman, banjo picker Kent Wiseman, and Billy’s mother, Lois. Billy began playing guitar professionally as a youngster with bluegrass great Charlie Moore, who had married Billy’s mother. He also played in Douglas Dillard’s newly formed “post Dillards” bluegrass band The Doug Dillard Band from Hollywood, which also featured Byron Berline and occasional guests like Vassar Clements and Sam Bush. Billy’s approach to the banjo is firmly rooted in Appalachian string music, but it can be deceptively eclectic. His influences begin at home and with his family, but Billy’s repertoire is vast, and he is comfortable in most musical situations. 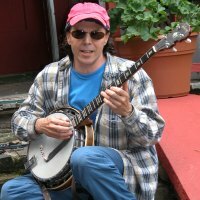 In addition to banjo, Billy is also an accomplished musician on the guitar, mandolin and violin. 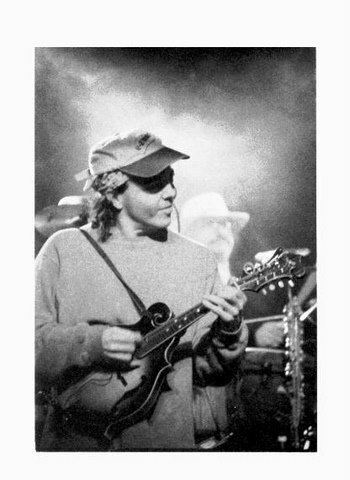 LKNB’s Mark Schimick says in the same interview, “Billy Constable was the main bluegrass teacher for Jon Jon and myself,” he said. “When he first heard us play, he heard a bunch of green musicians, as far as bluegrass is concerned, but he heard how we knew to play the rhythm to it,” Schimick said. For more information about Billy Constable and for updates on his medical situation, please visit: www.billyconstable.com. Asheville’s rock ‘n’ roll duo Mad Tea Party celebrate their favorite holiday again this year with ROCK N ROLL GHOUL, a follow-up to 2009’s ZOMBIE BOOGIE. With garage-rock icon Greg Cartwright (Reigning Sound, Oblivions) at the production helm, this year’s monster offering promises to make you howl at the moon. Mad Tea Party provides their usual palate of shimmering vocal harmonies over Jason Krekel’s one-man-band juke joint guitar/percussion and Ami Worthen’s electric ukulele. Of course, ROCK N ROLL GHOUL also includes some sonic surprises. The EP offers up 4 spooky selections for your rockin’ Halloween party. “Possessed,” a 60s-tinged psychedelic number, features Worthen’s wicked vocals and a demonic guitar solo from Mr. Cartwright. The furious screamer “Rock ‘n’ Roll Ghoul” expounds upon the theme of flesh-eating music critics while drivin’ rocker “Dr. Phibes” is an ode to the popular Vincent Price villain. The duo close with the Hollywood Flames’ song “Frankenstein’s Den” with Cartwright on drum kit and Caroline Pond (Snake Oil Medicine Show) joining Worthen on doo-wop vocals. ROCK N ROLL GHOUL is available as a 7” vinyl record and as digital downloads. The EC horror comics inspired art for the record was hand drawn by San Francisco artist Gus Cutty. Start off the season with some new spooky songs! If you pre-order the vinyl record before October 1, they will also give you a limited edition hand-carved Dr. Phibes poster by Mad Tea Party’s own Jason Krekel! Larry Keel and Natural Bridge has a fun weekend in store to celebrate the Spring Equinox! The audience at a Larry Keel performance is not simply being entertained, instead, they are having their hearts and brains happily steamed in a boiling cauldron of blazing instrumentation and BRAND NEW original sounds. Driven jamming is linked in flawless cohesion to brilliant and multiple variations. This band is anything but ordinary! A band of kindred spirits who share a common musical vision. Friday night 3/19 at the New Earth Music Hall in Athens! A two-time national flatpick champion, Keel is known for his guitar style and a low, soulful voice. Also performing: Crawford-band Efren, which released its debut, “Thunder and Moan,” late last year. The evening will be the public’s first chance to taste Iron Tankard Old Stock Ale, the first of four beers in Terrapin’s “Georgia Theatre Sessions,” a limited series of ales brewed to raise funds for the reconstruction of the Theatre. Terrapin Beer Co. will release the first of its “Georgia Theatre Sessions” brews at a benefit concert for the theater March 19. At 7 p.m., Terrapin’s Iron Tankard will be tapped at New Earth Music Hall. The old stock ale is named after the iron swimming pool that was housed in the Georgia Theatre when it first opened as a YMCA. BorderHop Trio and Larry Keel and Natural Bridge will play at at 9. Iron Tankard is the first of four beers in the “Georgia Theatre Sessions” series. Each beer takes on a name from a different era in the building’s life. On Saturday, Larry Keel will play two sets on the main stage. A bluegrass guitar virtuoso with a fierce flatpicking style, Keel is guaranteed to entertain. With Natural Bridge, his amply capable band of pickers, Keel’s music bridges the gap between traditional bluegrass and contemporary Appalachia. If you are in the south and wanting to hear some kickass flatpickin, a strong and steady bass, with some fiery mandolin and banjo; get your bum in gear and head out to one of these shows! 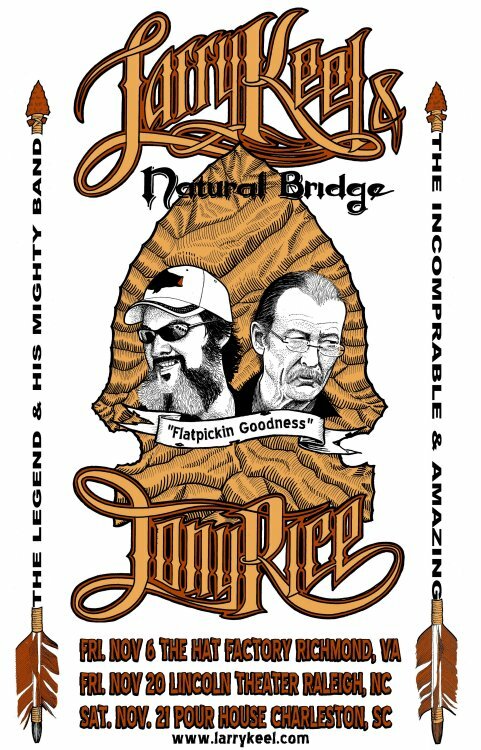 Larry Keel and Natural Bridge with Tony Rice this weekend! Pushing the boundaries of both bluegrass music and their instruments; two of the most innovative and influential bluegrass flatpickers around, Larry Keel and Tony Rice, are teaming up for a few fall shows. The musical styles will mash up nice and strange this Thursday when Asheville-based duo Mad Tea Party (pictured) shares the stage with hometown cronies Toubab Krewe at the Pour House. Mad Tea Party used to do more of a 1940s-style, vaudevillian/blues/jazz thing, but singer/ukulele player Ami Worthen and guitarist/singer Jason Krekel look and sound more like a polite rockabilly act from the late 1950s these days on their new album Found a Reason. The rambunctious duo’s latest offering might be the coolest Halloween-themed disc of the season — a ghoulish-looking, reverb-heavy four-song CD/vinyl disc titled Zombie Stomp (“So you thought vinyl was dead? And the ukulele? Letter-press? Well, think again,” the band warns). On a very different wavelength, Toubab Krewe is an Afrobeat/funk fusion musical project out of Asheville comprised of Teal Brown (drums), Drew Heller (guitar, soku), Justin Perkins (guitar), David Pransky (bass), and Luke Quaranta (percussion). Their latest is Live at the Orange Peel.